With a generous contribution from Norsonic Brechbühl AG, a Swiss company, the construction of the classroom building for Aunt Lucy Nursery School Bushura in Kanungu could be continued. A first step, installing doors and windows, was already completed in April 2010, and the next activities will be the plastering of the walls and flooring of the remaining rooms. 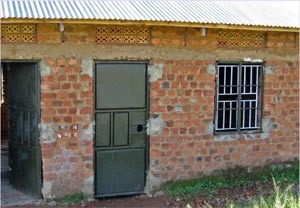 The nursery school still uses the church nearby and a temporary building to have enough classrooms for the 121 students between two and six years.